Helicopter parents are so yesterday’s news apparently. Now those same parents are snowplowing their children’s woes out of the way, so the kiddos don’t have to feel the crush or cold of the snow. See that’s probably part of my problem. I actually like snow. Okay, so maybe I’m not wild about driving in it and I’m not exactly bouncing around in it barefoot. Oh wait, I actually have walked around barefoot in the snow. And it was cold. Duh. Point is, I figured it out. And bad mommy that I am, I’ve often let my own kids learn those kinds of lessons by themselves. Even my students are forced to claim their own consequences with the hands-off approach I sometimes take. I’m there to help (I think) but I don’t tell them that they (or their work) are wonderful when they’re not. Bella English of the Boston Globe did a good job of laying out a powerful imagery in her juxtaposition of monster snowplows protecting fragile little teacups. These snowplowing parents think they’re doing their kids some kind of protective service but they’re not. Unless those snowplows plan on never breaking down, they’re more likely creating mountains with their meddling than any sustainable clear path to the future for their children. Sorry, but it snows –and rains. Stuff happens. Horrible, tragic, impossible-to-get-over stuff happens. Impossible-to-get-over, that is, because some of them have never learned how. I know a few of those teacups. It seems they can’t hold too much before they overflow and become so easily broken. I have a story about the bone china teacups in my own dining room cupboard. Wait –that has nothing to do with where I’m going. Did you know that genuine bone china is actually made from calcified bone? It’s bone ash mixed with clay to create something delicately beautiful. Even if you ignore my totally sledgehammer rising-from-the- ashes metaphor, I’m hoping you won’t miss the powerful notion of resilience. 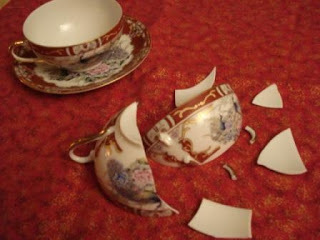 My little teacups have often been through stuff. Those mega-engine plows have been unable to prevent the storm or whopping wallop fall of snow to the teacups entrusted to their care. Those porcelain babies have been pelted –and hard. But they are weathering the storm. Somehow, regardless of how translucently bare and vulnerable they appear, they’ve figure it out. They’ve gotten through to the other side -in spite of the weather and of those stupid snowplows which hold the power to protect, but sometimes shatter them to shards.